The words plaque and tartar are often used interchangeably when people are talking about the bacteria buildup on their teeth. However, there are a few key differences between plaque and tartar that we want you to know about. Plaque is a clear sticky residue that is constantly forming on your teeth throughout the day and night. Food particles, sugar, and saliva all combine to form this residue which makes your teeth to feel dirty between brushings. Plaque begins to develop on the teeth several hours after brushing (even if you have excellent oral hygiene! ), which is why it’s really important for everyone to brush and floss at least twice a day. Always remember that regular interruption of the bacteria growth in your mouth is essential to maintaining a healthy smile for a lifetime! When plaque is not removed regularly and/or thoroughly, it hardens into a substance called Tartar (or Calculus). In other words, tartar is old plaque that can no longer be removed easily with your toothbrush and must be removed professionally by a dentist or dental hygienist. Tartar buildup gets harder to combat as it progresses. 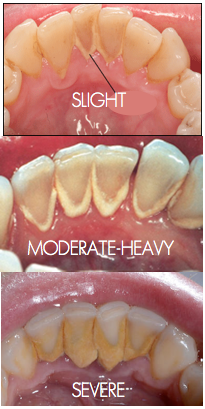 Check out the images below to see how tartar worsens over time. When tartar isn’t treated promptly it can be bad news for your smile. The presence of tartar in your mouth makes it much harder to brush and floss effectively. And when you aren’t able to brush and floss effectively, you are at a high risk for both tooth decay and gum disease. Developing a great oral hygiene regimen is the best thing you can do to help reduce plaque and tartar buildup. This includes brushing two times a day for at least 2 minutes each time, flossing once a day, and visiting the dentist for hygiene visits at least twice a year. Orthodontic treatment can be another solution for patients who struggle with plaque buildup. Many times crooked teeth are harder to clean, resulting in areas that are hard to clean at home with your toothbrush. If you struggle with hard-to-reach areas due to crowding or overlapping teeth, we recommend that you visit an orthodontist for a consultation. Another great way to help prevent plaque and tartar buildup is to incorporate foods into your diet that are natural plaque-fighters. Some examples of these are apples, celery, cheese, and carrots. Remember: everyone experiences plaque buildup regardless of how well you care for your teeth and gums. This is why it’s important to disrupt the bacteria every 6-10 hours in order to ensure that plaque on your teeth does not develop into tartar. This blog is really nice and informative.Thanks for sharing. This blog is very helpful. Thanks for the sharing.